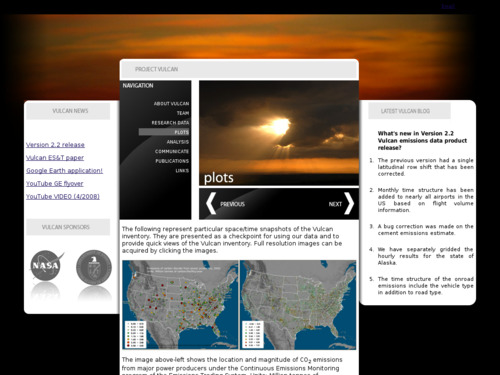 The images would work well with any climate or carbon cycle unit or lesson. The first five images are the most useful and are good resources for initiating discussions about variable sources of CO2 emissions. Educator may find the other images confusing and needlessly political. These maps would be useful in discussing questions such as "Should you buy an electric car?" The project aims to aid in quantification of the North American carbon budget. These datasets and maps show CO2 emitted by location, in very fine detail. The detail and scope of the Vulcan CO2 inventory has made it a valuable tool for policymakers, demographers, social scientists, and the public. Comment from expert scientist: The review is for Images related to different sources of carbon dioxide in the US based on the 2002 inventories. The information provided by the images are useful for those interested to get a snapshot of the source strengths in different areas in the US although one has to be careful with different units used in the different maps. The YouTube video at this site explains the Vulcan Project and the images in this resource. The link from this page takes you to data from 2002. On the 'Research Data' link, you can access data through 2008. Images are clear and explained on the Vulcan Project site.